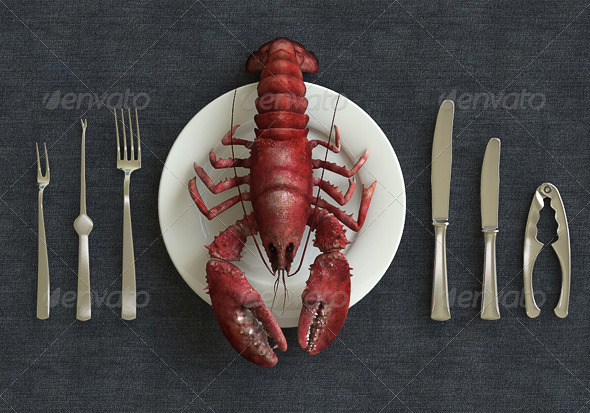 3D model of Ocean Lobster. Textured, rigged and skinned. With bones and inverse of forward kinematics (IK/FK) you can change poses of lobster or animate them. Opens with 3DS Max 2008 (or later versions) + Vray 1.5 RC5 . Also dish, knifes and forks included in archive. All textures and hdri map included. Also lobster mesh without bones exported to OBJ format if you want to use it at another applications. Polygons: Only lobster – 20.966 polys, with meshsmooth – 77.474 polys. Only dish, forks and knifes – 26.248 polys, with meshsmooth – 100.000 polys. - You can simply change the pose or animate skinned lobster. - Simple MP4 video tutorial with basics how-to change pose and animate it in 3DS Max 2008.